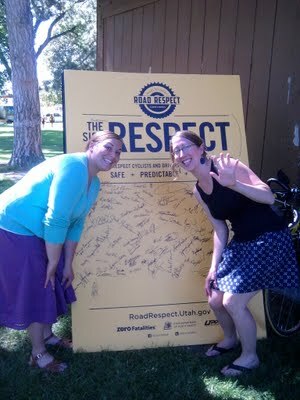 This afternoon, cyclists came from all over Provo to meet up with the Utah Road Respect Tour – sponsored by the Department of Public Safety, the Department of Transportation, Mad Dog Cycles, and Bike Utah. We agreed to ride (and drive) with regard to other road users, and heard about road safety from Mayor Curtis, Bike Committee Chairman Zac Whitmore, and UDOT representatives. Cyclists also enjoyed ice-cream, free bike tune-ups from the Bike Committee, and new friends. 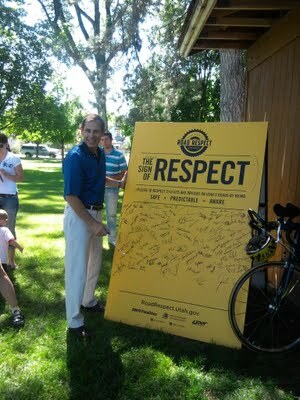 Thanks to UDOT, MadDog Cycles, and Bike Utah for getting the word out about safety on the road. And, thanks to everyone that came out to support the message. Remember to ride safely out there and keep an eye out for cyclists when you’re on the other side of the wheel. Just a small correction. This event and campaign is sponsored by the Utah Departments of Public Safety and Transportation, not UTA. Also, Bike Utah and Mad Dog Cycles are Sponsors. Thanks for reporting and supporting! Brad thanks for the heads up we got the post corrected. Also, thanks for the great work you guys are doing. Have a safe ride across Utah. It was a fun stop in Provo! If you’re up for it, we’d love to have you report back after the ride is over!